Slow sinks and toilet backups are frustrating problems when you’re a homeowner. If you can’t get your stubborn clogs out, you have repeated problems, or you don’t even know where to start, call Corley. We have skilled plumbers in Simpsonville SC who have dealt with every kind of clog there is. They’ll be able to diagnose your problem and fix it fast. They all come with excellent equipment on their trucks, so they can get the job done quickly. Sometimes, it’s obvious when your Simpsonville, SC home is having a drain problem. Maybe you can’t get anything to go down your drains, or they consistently run slow. Other times, you may find yourself standing in water in the shower or realize your tub hasn’t drained from last night. And when the toilet backs up, everyone knows! Other times, it’s not so obvious that there’s a problem. This often happens when the clog is deeper into your plumbing system, or even in your sewer. 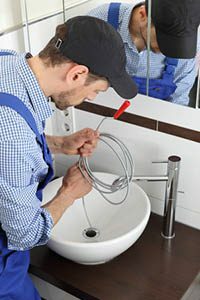 Look for the following issues and call a plumber immediately if any of them are happening in your home. Multiple backups at once. If one drain isn’t working, there is usually a clog somewhere close by. If several drains aren’t working, though, and they are all over the house, this can be a sign that there’s a more significant problem somewhere deeper in your plumbing system. Repeated backups. If you feel like you’re always dealing with a backup somewhere, you could have a clog deep in your system. More than one or two backups in a 2-3 month period usually warrants having someone out to take a closer look at your system. Sewer smells in your home. If there’s a clog in your sewer line, that means that sewer gases can’t escape. They can build up and, finally, backflow into your home. You’ll know when this happens because your home will smell really, really bad. This is a sign that you need a sewer clog fixed. Sewage backflow. If you notice dark, smelly water flowing into your toilet or back into your sinks, tubs, and showers, you may have a sewer clog. This is the water that is supposed to go down the sewer line, NOT flow back into your home. When it begins to do that, you need to get out of your home (because this water is dirty) and call a plumber immediately. Problems when your run your washing machine. If your toilet overflows or your other drains back up when you run the washer, there could be a sewer problem somewhere. This water should drain normally, without a problem. Whether your drain problem is easily fixed or requires a major repair, Corley’s plumbers are up for the job. We will worry about getting everything fixed right, the first time, so you don’t have to stress. We guarantee our work and we never leave until you’re completely satisfied, so feel free to ask questions and test our work.